Science fiction has humans cured of genetic diseases by tailored re-engineering of their genes. It’s coming closer to a reality, with a recent report on treating mice with haemophilia B by re-engineering the ‘broken’ gene in mice. Haemophilia is an inherited genetic disorder that disrupts blood clotting. 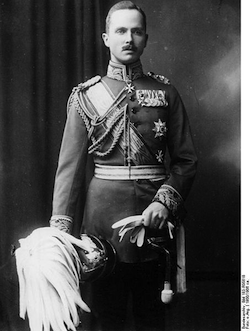 Prince Leopold, son of Queen Victoria and Prince Albert. There are two main forms of haemophilia, imaginatively called A and B, although to be fair haemophilia B is also known as Christmas’ disease after Stephen Christmas, the first patient formally identified with it. Both haemophilia A and haemophilia B are genetic disorders caused by variations of blood clotting (coagulation) factor genes that result in less of the protein that the gene codes for, or a defective protein that it doesn’t do it’s job well. Taken together the forms of haemophilia occur in around 1 in 10,000 males. It’s an X-linked disorder; the genes affected lie on the X chromosome. Women have two X chromosomes and men one (along with a Y chromosome). As men have only one copy of the gene–they have only one X chromosome–if they have a defective copy of the gene as it’s the only one of that gene they have, they’ll have haemophilia. Women have two copies of the gene, one on each X chromosome. If one copy is OK, it can make up for the other being defective. For a woman to have haemophilia, both of copies of the gene would have to be defective. As most women who have a defective blood clotting gene (there are several) will have only one defective copy: they’ll be carriers of the disorder, not having the disorder, but being able to pass on the defective gene to their children. Being a genetic disorder, one way to cure haemophilia might be to repair or replace the defective gene. You could consider it a permanent fix. If you can put the genes right, they will pass the repaired or replacement genes on as the cells in the tissue divide and the patient have a long-term cure for their illness. Most people with haemophilia B have levels about 1% of the normal levels of the factor IX protein in their blood. Boosting that to about 5% of normal levels changes severe haemophilia into a milder form. So one possible cure might be to boost the levels of the factor IX protein by adding a replacement of the F9 genes, which codes for the factor IX protein, to patients liver cells. A recent article in Nature describes treating mice with an inherited form of haemophilia using genome editing, altering specific parts of the genome to change how particular genes are used, in specific tissues (organs). In particular, they wanted to edit the genome of the cells in the body, not remove some tissue, edit the genome of the cells once removed, then re-inserted the cells back into the body. Having to extract cells and then add them back limits what kinds of cells (tissue, organs) can be treated. Being able to treat cells right in the body opens up other tissue types to treatment. What these scientists were testing was if this can be done at a meaningful level in a living animal, a mouse. Their treatment uses ‘designer’ zinc finger proteins (more on these in a minute) to edit the genome, creating a break in the DNA, which the replacement gene is inserted into. Using designer zinc finger proteins to make changes in a genome isn’t new. The components for the research team’s treatment are a designed zinc finger protein and a replacement gene for the damaged one. Work towards designing zinc finger proteins to bind chosen sequences in genomes goes back many years. The designer zinc finger protein is made of two parts: a DNA-binding part and a DNA enzyme that cuts DNA. The DNA-binding part is engineered to recognise just one DNA sequence in the whole genome. Genomes are very big – gigabases long (thousands of millions of bases). In order for a sequence in the genome to be unique, found only once, it has to be fairly long, much longer than the binding sites of most of the proteins that regulate genes. The solution is to string together several small DNA-binding units to bind adjacent to one-another to make a DNA-binding domain that binds a much longer sequence. The small units used are zinc finger domains, a small part of a protein (a peptide) of about 30 amino acids long that bind a single zinc ion (one is shown in the figure above). Altering the amino acids on one side of the zinc finger domains, changes the DNA bases that zinc finger domains bind. 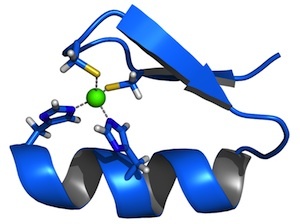 A lot work has gone into working out what combinations of amino acids on the DNA-binding face of zinc finger domains bind what DNA sequences. Having got a DNA-binding domain that can bind where you’d like it to, you want to make it do something. So far it could only bind to the targeted DNA sequence and sort-of just stick there. That might be useful (in principle) to ‘hide’ a stretch of DNA so that other proteins can’t bind it, but that’s not much use for what is wanted here. The idea of their treatment is to insert a replacement gene into the genome. This is done by cutting the genome to create a double-strand break, cutting across both strands of the DNA, and providing a copy of the replacement gene to be inserted where the cut is. To make the DNA-binding domain do this, the cutting part of a DNA-cutting enzyme (a nuclease) is added onto the end of the designer zinc finger protein to create a zinc finger nuclease. Now we’ve got a protein that binds to a particular DNA sequence that will cut the DNA adjacent to where it binds, to create a cut for the replacement gene to be inserted. Genes are controlled–turned on and off–by proteins binding to nearby regions in the DNA. These regions are important for controlling a gene in a body it can be useful to be able to leave these regions as they originally were. The replacement portion of the gene was added after the beginning of the original gene, but before the regions that tend to be damaged. (See figure above.) This leaves all the regions that are used in controlling the gene as are they originally were, only replacing the bit that is defective in most patients. It also covers for that there are many different changes that can make the F9 not work – the idea is to replace all but the very first bit of the F9 gene, so the replacement can compensate for defects in all but the first part of the gene. Mammalian genes, like most gene in most eukaryotes, are made of shortish portions of a gene, exons, interrupted by stretches of DNA that are not part of the code for the product of the gene. (The exons are the black boxes in the figure above.) The insertion vector–the DNA being added–was targeted to be inserted between exon 1 and the remaining exons at the point marked by the arrow. Most (95%) of the mutations seen in haemophilia B are in exons 2 through to the end of the gene. Now the cutting protein and the gene to be inserted has to be gotten into the body and make it work in the cells we want to add the replacement gene to. ‘Delivery’, getting a drug or remedy to the part of the body it is to act, is important in developing new treatments. One way to carry genes into cells is to use modified viruses. Viruses have evolved to carry their DNA into a cell, injecting it into the genome of the cell and getting the cell to produce the products of it’s genes. What scientists are doing here is using what viruses naturally do for their own use by adding to the virus genes they’d like present in the cell the virus infects. The two parts–the designer zinc finger protein and the replacement gene it inserts–were delivered separately. The zinc finger nuclease was delivered to liver cells using a modified mouse virus that infects liver cells. When the virus infects the liver cells and becomes active, it will produce the zinc finger nuclease protein in these cells. A similar virus was created that carried the replacement for the dysfunctional F9 gene. To work around this the researchers tested mice with their F9 gene replaced with a defective human F9 gene in it’s place, one that is expressed in liver cells. Because there are two separate components, tests can check combinations. Tests compared the original mouse (known as the ‘wild type’ – the WT in the graphs), with only the zinc finger nuclease (ZFN) given, with the zinc finger nuclease and the replacement gene (called the ‘donor’ in the graphs) given, and the zinc finger nuclease and a mock replacement that does nothing (this is what is known as an ‘internal control’ for the experiment). The graphs I’ve included in the article show the results of some of the tests done. To measure if the treatment was having an effect, the researchers measured the level of human factor IX protein in the blood of their mice. That’s the hF.IX in the graph. 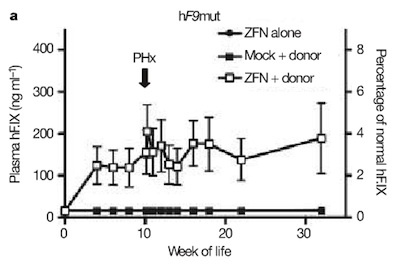 The first graph (above) shows that the only combination that raised the level of human factor IX protein in the blood of the mice was the treatment – showing that the treatment had the effect intended. It also shows that the levels of factor IX in the blood of the mice stayed raised for many weeks after the injection. (Mice were treated using an injection at day 2 of their life.) If a genetic cure is to work, it needs to stick around and be passed on when cells divide to make new cells. This seems to be happening. Finally, they checked how well the mice were able to form blood clots, measuring the time taken for clots to form. Shorter times are better. On the left you can see the range of times for normal mice. Next to it are the times for the treatment. These are only the slow side of the normal times, but quicker than the times for the non-treatment tests shown to the right. The one on the far right, marked ‘HB’, are mice with haemophilia B. 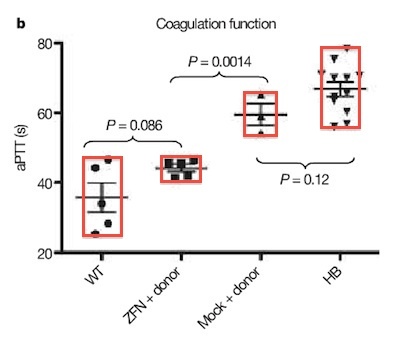 This shows that this treatment has the potential to restore mild clotting to haemophilic mice. There still is a long way to making this into a human treatment, but this ‘proof of principle’ experiment shows there is promise that this approach may be useful. This work is the latest in a long string of work that I have been following for since I was a Ph.D. student. 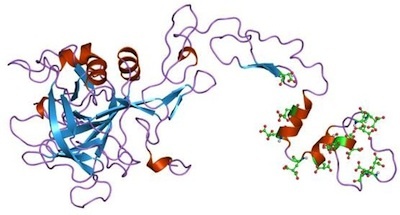 So-called ‘designer’ zinc finger proteins have risen from academic interest, to possible use and now to proof-of-principle treatments and products for altering gene expression. There are many other zinc finger proteins, both natural and engineered; each has an interesting story to tell. If there is interest, I hope that I might bring you some of these story as an informal series, by tracking back to the origins of the story and working our way back to the current day. All figures are either taken from Wikimedia Commons or Li et al.’s research paper. The red rectangles in the last graph, showing the effect of the treatment, are my own addition. I’m leaving aside a class of proteins that are used to organise the structure of the genome that have long binding sites to keep things simple. These are CCHH zinc finger domains, the ‘original’ zinc fingers. There are many other domains that are (annoyingly to some) also called zinc finger domains that use different amino acids to bind, or co-ordinate, the zinc ion. In the case of CCHH zinc fingers, it’s two cysteine amino acids (providing the ‘C’s) and two histidine amino acids (providing the ‘H’s). C and H are the single-letter amino acid codes for cysteine and histidine, respectively. I’ve left out many tests, including all the tests checking what happened to the genome in mice. They’re important to scientists, but they make for long a story and it’s already quite long enough as it is. My Ph.D. studies mainly focused on this family of proteins. Monkey business, or is my uncle also my Dad? For male pygmy marmosets, their genetic father could be their uncle. Confused? Check it out. Temperature-induced hearing loss A few rare individuals have temperature-sensitive hearing, losing it when they have a high body temperature. The error is actually an editing error: the â€˜andâ€™ should have been edited to a comma. Iâ€™ll put it right when Iâ€™ve time. I have a long-standing interest in this family of proteins and their roles in both natural gene regulation and biotechnology going back to my doctoral studies. It’s still incorrect, because the Tsarevich was very far from being the only haemophiliac male descendant of Queen Victoria, as the pedigree included in my previous post shows. It’s also somewhat misleading to refer to the Romanovs, plural, as haemophiliac male descendants of Queen Victoria because that description covers only one Romanov, the Tsarevich. Please note I wrote the male descendants – plural. Also note the photo to the left. What was the F9 variant of the Romanovs? Malmö?